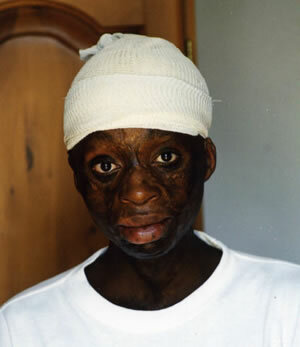 Mungo Nete (not his real name) was unemployed in June 2012, a burns survivor aged 25 years old. While he had worked for a while in a food shop, his mother said that customers were prejudiced about his appearance and said that he had a "skin condition." They reacted as if his burns scars were catching. She asked that his name be changed on the website, because more people could search by name, now that expensive mobile phones have access to the Internet. It was hard to hear her describe her son as "physically disabled" when we know that he is not. It is like giving up on a life that has barely begun. While we gave Mungo great surgery and many esteem-building chances, a collection of problems throughout his life have made him hard to employ. He needs to regain belief in himself and at the same time to recognise that millions of people are without jobs. Usually a burns survivor will have to try harder, to get work. While we have invited him on outings, Mungo now thinks he's too much of a man to have fun with the kids. He has not considered how good it feels to give back; to empower the other burned children to get the best out of life. No matter how big and tough he though he was, he still came back to us for help in January 2010. He had just been to circumcision school in the Eastern Cape at the age of 23 years 8 months. The process, which was not carried out by a doctor, did not go well. 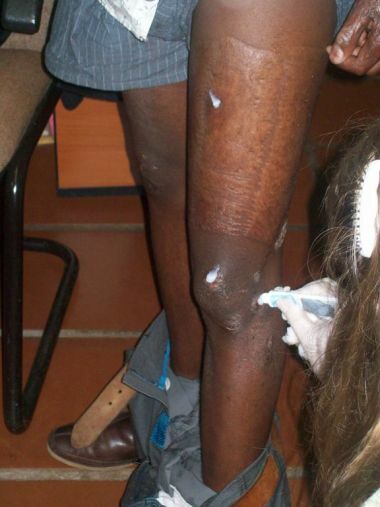 As he had an open wound, we referred him to urology at Charlotte Maxeke Hospital, after providing some First Aid. We also treated his infected leg wounds sustained after he was briefly trapped in a burning hut, at the same circumcision school. Mungo also failed his Matriculation (school leaving) exams and has to reconsider the way ahead. March 2004: All he wanted was a head of hair, a broad smile and a chance to study for a better future. Here are pictures of Mungo Nete who underwent his second tissue expansion with us from August 2003 to January 2004. 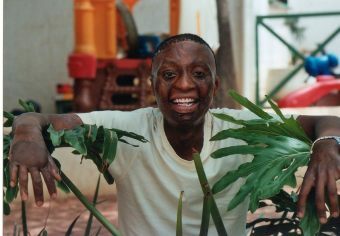 Mungo Nete went into Milpark Hospital, Johannesburg, early on the morning of Thursday 22nd January 2004 to have his second tissue expander removed and a skin flap inserted by Dr Gavin De Aguiar. The tissue expansion had not gone as well as hoped this time because Mungo's four year old half-brother Loved punctured the skin with a fingernail by accident, creating a large circular tear. But with Dr De Aguiar's skilled surgery, we still hoped for a great outcome for Mungo. At the age of 17 years 9 months old Mungo was still only in grade nine at school because of the way in which the injury and surgery have disrupted his life. The surgeon and anaesthetist work pro Deo, Netcare bore the cost of accommodation and the charity covered the cost of all medical consumables. November 2001 Mungo has been undergoing tissue expansion of his scalp for months, staying in the home of trustee Bronwen Jones each time he received an injection of saline. 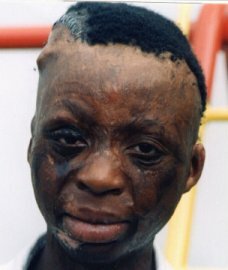 On November 27th 2001 he had the strangest-looking head in Johannesburg; on November 28th the tissue expander was removed and his head morphology was almost back to normal. Mungo was usually very stoic but he did not cope well with the anaesthetic that time round; it led him to vomit a great deal and the morphine drip did not ease his discomfort as much as he would have liked. The drain from his freshly bandaged head seemed quite alarming with its continual flow of blood. He barely ate anything until the evening of December 1st, when his guardian Bronwen took him home for a celebratory braai (South African barbeque). Maybe it was just too much for a 15 year old boy, being in a ward of sick old men, even though his fellow patients were very kind to him. The treatment at Netcare's Milpark Hospital was in marked contrast to many state hospitals visited recently, from the friendly welcome to the quality of food. It is a pity that Mungo had no appetite. Mungo's tissue expander has been removed and the stretched hair-bearing skin moved over to the side of his scalp where he lost all his hair when he was burned. We had no idea how well it had worked while his head remained tightly bandaged. His eyes still did not close fully when they are relaxed in sleep, and it was not clear if more work could or should be done on his hand. He will remained living in Bronwen Jones' family home for some time, until the skin had taken very firmly to its new position. The surgeon and his anaesthetist worked pro Deo; Netcare took the same approach for nursing and accommodation. The charity met the cost of the theatre consumables and ward dressings. For the insertion of the tissue expander many months before, the consumables cost R10,000. This is considerably higher than in the state system which at that time got most medication at one third of the cost that is charged to the private sector, but Mungo would not have got this operation at all in the state sector in Gauteng province. Surgeon Gavin de Aguiar's provided a skilled and successful solution. Mungo was a remarkably good patient throughout this time (except for losing pressure garments twice!) and coped very well with a space-age appearance, even when it seemed the long rasta hat we bought him was too short to conceal his 'bubble-head'. Mungo Nete was born on April 29th 1986. His father abandoned the family early on, but Mungo remains in his mother Lina Boniwe Nete's care. For a while he also has a supportive stepfather called Wellington Bonakele Madokweni and they all shared a small two-room shack at in 7th Avenue, Alexandra Township, near Johannesburg. That home was sadly demolished when it was decided to turn the plot of land into a tourist venue, as Nelson Mandela had once lived on the same site. Also living in the same shack were Mungo's brother Thembelani Nete age 18; his stepsister Ntombozuko Nete (and her child Jomo Sinovolo Nete age 6); his half-sister Luthando age 2; his uncle Andisiwe Nete who is only two years older than Mungo, a distant cousin Vathiswa Qumashe, mother of Sibongile (3), studying for Std. 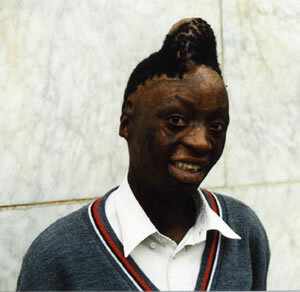 9; and a young woman known as Nomhle (20) who was not a relative. Ntombozuko stayed home to look after Vathiswa's child, Sibongile. Jomo attended the Thabiso creche. Andisiwe went to Minerva High School - in Std 9; Thembelani is in Std 6 at Minerva School and Mungo started Std 5 (Grade 7) at Ithuthe Primary School in January 2002. Mungo has no living grandparents on his mother's side and there are no details of relatives on his father's side. The home was very poor and crowded, but clean. At night Mungo usually had to share a single bed with his mother and little Luthando. On August 5th 1997 two people living close to Mungo's home, lit a brazier (known locally as an imbawula) to try to get warm. Mr Dlamini and Mrs MaNgubo poured thinners on the fire and claimed that they did not notice as Mungo opened a gate to the yard and walk towards them with little Jomo. The flames soared into Mungo's face, burning much of his hair away and as he raised his hands in panic, burning the skin away there too. Jomo escaped unscathed but Mungo was rushed off to the local clinic and from there, to Johannesburg General Hospital. 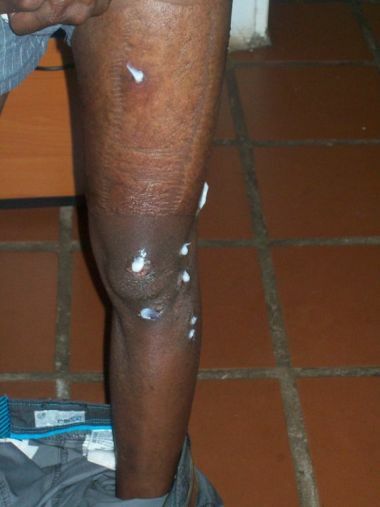 He received some skin grafts and remained in hospital for many months. When he finally went home, he had fallen far behind in his education and his self-esteem was at an all-time low. 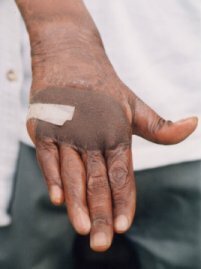 Further surgery involved literally 'burying' his hand in his groin (for a live skin graft), resulting in a rather puffy patch on the back of the hand and having the unintended effect of introducing raised lumpy veins in the groin area. Much of this only became apparent when the charity offered to help Mungo. On first assessment in 2000, it became clear that some of Mungo's problems would never be tackled in the state hospitals and that some of his problems had been caused by treatment in the state system. Mungo was already 14 years old and on the brink of manhood, yet was four years behind where he should be educationally. We established that, in common with many other paediatric burns cases in South Africa, education seems to be the last thing on anyone's mind when the child is hurt. And yet, if the whole social and emotional circumstances are not taken into consideration, the burned child in addition to likely disfigurement and disability, also has the burden of being far behind his peers in the school system. We recognised that it was make or break time for Mungo. If he didn't get back on track educationally and if he didn't have certain operations to improve his appearance, and to improve function, he could lose hope and just be a burden on his family. We took him to see several surgeons and Dr Gavin De Aguiar agreed to take on his case, assisted by anaesthetist Dr Jacques van Westing. 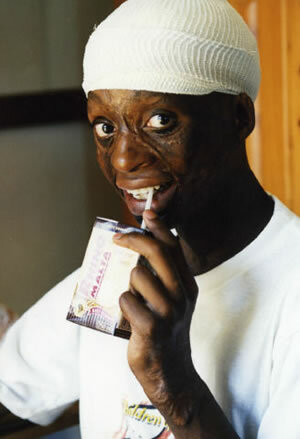 In early 2001 Mungo was operated on at Milpark Hospital in Johannesburg. 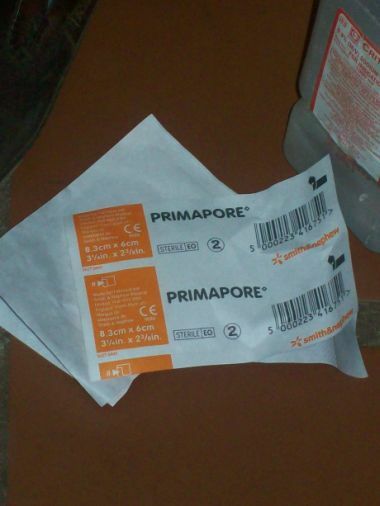 In order to be sure that it was safe to use skins for grafting from the groin area, we had to first take Mungo to a urologist Dr David Smart. 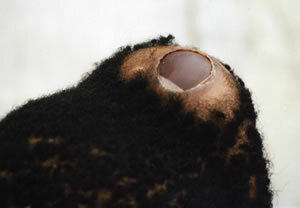 The 'lumpy veins' are unfixable but fortunately the blood flow in them is in a direction that is not dangerous, so the area could be used again for 'donor skin'. Mungo received a tissue expander that helped him regain a more normal hairline. This was not available at that time in the state system in Gauteng Province, South Africa. Mungo also received a skin graft below the lip to help him smile more easily; the puffiness of the hand graft has been reduced and a new pressure glove (made of stretchy elasticised material) fitted to the hand by an occupational therapist. While undergoing his first operation, the surgeon realised that Mungo could not close either eye fully. The right eye was particularly bad and over the next few days it became noticeably red. The surgeon decided to take Mungo to theatre again and to put a substantial overlapping skin graft into the right eyelid. If this were not done, he would have been at risk of a desiccated cornea. In June and July 2001 Mungo had to return to the hospital once a week or more, to have saline injected into the tissue expander. 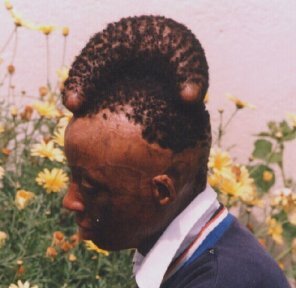 His scalp - at first with a neat line of metal staples across it, became a more and more peculiar shape until the expansion was complete and the tissue expander could be removed. It needed to be kept very clean and as one puts on a cream, the surface feels a little like a waterbed in one's head. Mungo had to abandon his favourite game of soccer until expansion was complete, as he must not knock his head in any way. 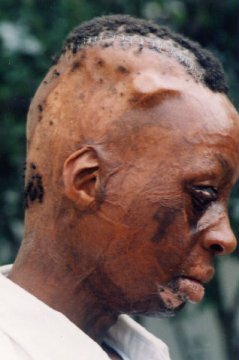 The incision on the scalp and the graft beneath his mouth are treated with a topical antibiotic called Bactroban and the graft on the eyelid is treated with another cream called Chloromycetin. Mungo's mother said that her son was 'silenced by his scars' but after surgery she said he had hope again. He stayed with Bronwen Jones' family over many weeks in Auckland Park and enjoyed having his own bed and own space. He continued to overnight there around each tissue expansion time. He even celebrated his 15th birthday there when he became the proud owner of a remote-control car, a top quality soccer ball and some soccer boots, as well as a collection of little animal toys for each night spent in hospital, new books and new clothes. A local school assisted with some worksheets to ensure that he didn't fall further behind in his schooling while recovering from his operations and Marius, a first year medical student from Wits University, came and gave Mungo a little personal tuition. Mungo was also taught some skills that all the women in the shack at home might never have let him learn - he could then sew on a button and iron his own shirt, as well as make pancakes and cook a chocolate cake. Mungo attended Ithute Primary School at Alexandra. He would prefer to go to a less crowded school with better facilities. He used to say that he would like to study to be a doctor but first he had to get more confident with his long division! Mungo is a kind-hearted boy who seems young for his years but each day he is more confident and more mature. He likes little children and was happy to help and to play with fellow burn survivor Dorah, as well as playing Scrabble and Monopoly with older children too. While we were visiting one surgeon, we met Mr Rautenbach, aged 33 and still dealing with problems related to burns injuries three decades previously. At the age of 3 he had plugged in a bar heater, with its bars covered in wire, and held the bar to see if it would warm up. He got stuck on it as the electricity came through. Now he cannot move one finger properly, the palm is slightly contracted, and he gets blisters on the palm. 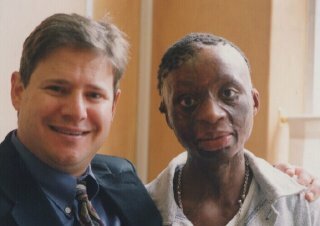 Mr Rautenbach is immensely grateful that he kept his hand but warns that people should never under-estimate the fact that Burns Are Forever. We wish that Mungo will turn a corner after his first "quarter century" and not use burns as an excuse to not live life to the full. Those who fail Matric can study in evening classes until they are qualified. Mungo climbed to the top of Mt Kilimanjaro in June 2007. Now he must climb his own psychological mountain. Maybe then he'll be brave enough to have his true name on these pages again.